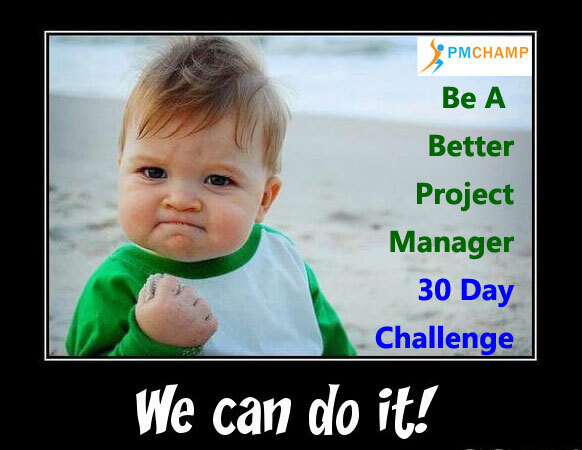 Welcome to the PMCHAMP Better Project Manager Challenge! Over 30 days, starting on the 1st of October, we are going to learn and apply simple ways to become a better project manager. You can do this challenge at any time but the live round will start on the 1st of October 2015. I have designed the challenge to be achievable but also effective. Read on to find out how to get started and join in. Let’s get better at Managing People, Projects & Ourselves! How does the Better Project Manager Challenge work? The better project manager challenge will be running daily here on the blog as well as via email and in our Facebook group throughout October. There will be a daily email during October as well as a range of posts that tackle different areas of managing self, teams, projects and more… All posts will be linked up here and the larger better project manager challenges will appear in the usual blog feed. You will be able to come back and redo the challenge later but the live emails will only run during October at this stage. Sign up for the 31 Days to a Better Project Manager newsletter at the bottom of this page or in the side bar and join the Facebook group. Then join along as the challenge progresses! Don’t worry if you miss the start, you can pick up easily at any point. Just jump in wherever you are at. The Better Project Manager Challenge run on the blog and via email is totally FREE! I run it to help my readers become better in small ways and execute success projects, and there is no cost involved. In addition to the FREE Better Project Manager Challenge there will be an Ultimate Better Project Manager package full of printables and checklists to help you not just with becoming better at managing self but everyday tasks, projects and people. More details to come! The only preparation is that you commit to spending the time in reading, planning and implementing the suggestions for each day. As you complete each day’s challenge, you will feel awesome, and would be able to see your progress within a few days. How much time will I need each day to complete the Better Project Manager Challenge? There will be daily tasks Monday-Friday that require approximately 15 minutes to 45 minutes, plus one weekend task that requires 1-1.5 hours. Obviously the exact amount of time required will depend on how long it has been since you spent some time at looking at your priorities, and planning for the long term.